It's funny to me now that I used "intelligence" as a guide to whether or not a being deserved to be tortured and murdered. Whereas now you use an entirely arbitrary classification system? I once burst into tears in the waiting room of my doctor's office, flipping through a National Geographic magazine. The photo which prompted this hysteria was of a marketplace in China, where cats in cages were being selected for dinner. The pure white one looked EXACTLY like the love of my life, my Mogul kitty. It's okay in this society to eat animals people never get to know, but eating dogs and cats is forbidden. When it has come to light that China routinely sends dog fur over here and passes it off as rabbit, somehow that pisses everyone off. Rabbit fur for some reason is no big deal. Carved, decaying, bacteria-laden muscles from cows is perfectly acceptable, but the average American will completely flip at the thought of eating horse meat. It's ALL disgusting. Someday everyone will evolve and stop eating this insane nastiness. That's what I pray for, anyway. Your hokey beliefs are getting in the way of making a good cartoon. This one's slop (har har). It's funny how you make fun of religion, yet cling to such a ridiculous, baseless conviction. By the way, where in the sam hill did you get the idea that pigs are intelligent? PIGS? Oink, oink? Come down to the farm sometime, dude. I support vegans, but I really don't have the self-control for it. I'm still working on eating meals that don't kill my bank account (and getting pretty good at it). Meat's expensive enough that I don't have it often, or much of it at a time (frozen dinners, anyone?) but my meals are always about my budget. This gal lives on ramen, rice, manager's discount fish, and Wendy's chicken nuggets. Love your logic. Instead of intelligence, I use eyelashes as the criteria for what I will eat. I won't eat anything that has eyelashes, so fish and fowl are fair game. Fowl less and less unless they can run away from whoever is trying to kill them. Hope you are having a great time at Comic-Con and our fair city is treating you well. The Good, Good Pig by Sy Montgomery is a must-read for all the non-believers. June, the poultry industry is terrible. When my friends who proclaim they no longer eat red meat tear into their chicken salads, I just shake my head. It's not judgement, it's concern for their lack of awareness. Hmmm, somehow pigs aren't intelligent because they say "oink" -- and this judgement is pronounced by someone who says "dude"? I’m totally with you on this one. An animal’s intelligence isn’t relevant to my decision to have him/her killed for my food. If they want to live and can suffer, and I don’t need to eat them to survive, I won’t. We wouldn’t dream of Ricky and Debbie nuggets. Yeah their intelligence is relevant -- to decisions like whether we give them a scholarship or have a beer with them. Seems every day there’s more information about the social and emotional lives of animals. I’d love to see more and more people expand their circle of compassion outward to include all creatures. Does Anonymous think 3-year old children are intelligent? What about dogs? Well guess what, they are... AND pigs are even smarter than both. My classification system is whether or not an animal suffers. I don't need animal products to be healthy, so I can't justify the suffering. You MUST read the article in O Magazine this month...as a vegetarian, I was literally gagging as I read it. Apparently happy pigs are tastier pigs, so this family prides themselves on raising happy pigs with very little stress, only to turn them into meat in the end. The whole "story" seemed unreal to me. We're supposed to be happy that they were well fed and not stressed out up until they were butchered? Yeah, great. 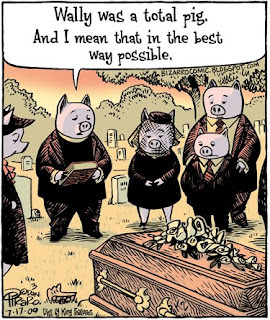 Is it all right to eat the meat of an animal who has died of natural causes, in your opinion? Does your ethic include or exclude such things as cheese or milk? A friend who grew up on a farm had similar thoughts about pigs and cows -- pigs have personalities and intelligence, once you get to know them, and cows are generally docile, friendly and trusting. However, he had a major problem with the chickens that he once had to feed every morning -- he said they were nasty, ungrateful birds who pecked at him and pooped on him as he tried to take care of them and that they deserved to die. (He said this with a certain maniacal glint in his eye.) I don't know what the term is for someone who eats no meat except chicken, but he was it. Finally, I liked A. Whitney Brown's line on why he's a vegetarian -- he said he was a vegetarian not because he liked animals, but because he hated plants. Some studies say plants do 'scream' when cut, but what will we eat if we excise them from our diets? Of course, you're all right -- no animal should ever suffer to end up on our dinner plate. 1.I have no ethical objections to eating an animal that died of natural causes, but most ethical vegans I know no longer want to do so regardless of how they died. After a certain amount of time, it begins to disgust you. To my mind, it becomes akin to eating a human, which most people wouldn't do unless it was a matter of survival. Regarding dair and eggs, these industries treat their animals as bad or worse than the meat industries do, and for longer. I have no moral objection to eggs or dairy, but won't support those industries. Chickens act like chickens when they are in a group. They don't relate well to humans, or any mammal, for that matter. When you get them alone, as we have when fostering chickens rescued in NYC, they act like pets. Dogs in a pack are not friendly, a dog in your house is a family member. Many people find chickens to be terrific pets, (except that they cannot be house trained.) The first time we fostered a chicken (had her in our apartment for a few days until we could find a no-kill farm to take her) I was shocked at how intelligent and affectionate she was. She learned where her food was and jumped up and down when we approached it, cheeped when we came in the room, cried when we left, sat on our lap when we watched TV. She was cool as hell. A. Whitney Brown was hilarious. He was one of the original writers on The Daily Show, before John Stewart was there. @ Piraro: Thanks for your thoughtful response. I try to get my dairy products and eggs from local farms where the animals are not mistreated, but it's hard sometimes to know who is telling the truth when they say 'free range' eggs or whatever. Oddly, the local dairy that produces 'natural' milk free of Bovine Growth Hormone and antibiotics, and is sold in a recyclable glass bottle, is owned by a conservative Republican. Go figure. In truth, "free range" means very little for the animals much of the time. To legally call them free range, they only have to have a small outdoor space available and not be in cages. Most free range farms still keep them packed into big tin warehouses with concrete floors and a small dirt yard they can get too. "Organic" means a lot to the consumer but nothing to the animal. It just means they aren't getting any hormones or antibiotics, which can actually be worse for them because if they are sick they go untreated. After all that, even "humane" farmers send their spent chickens and dairy cows to a slaughterhouse when they're "spent." Just to bust a myth, organically raised animals are not neglected if they get sick. They are treated but do end up in a non-organic herd or bunch after. Part of not having to treat animals with antibiotics is raising them in better conditions so they won't need them like they do in the large crowded conditions of the vast majority of farmed animal locations. For instance most organic milk comes from herds of less than 100 and even the factory farms that push the limits are a fifth of the size of the mainstreamed milk producing facilities. Further, organically raised animals eat organically raised feed which is better for the environment and those who have to work with it all (less exposure to toxic petro-chemicals). I say all this as someone who has gone vegan myself. And who loved Bizarro before either one of us were. I've been thrilled to discover our shared lifestyle and quite impressed with what I see as your intelligence since finding the blog... but the organic dying -for-lack-of-medical-care meme really irritates me. Why did I go vegan? Well, the start of the journey is that when I was eating flesh I had to do the mental equivalent of sticking my fingers in my ear and singing "la la la la la..." to disconnect from what I was chewing as all I could think of was that it could be my leg, or my arm. It was an expansion of not being able to eat tongue... might as well eat my own (EEKS). I would encourage those who are trying to make better choices to explore Local Harvest, Sustainable Table or even Eat Wild (or any of the other responsible food locators) to find local, well-raised food of all kinds including pastured (not that co-opted "free range" idea) eggs and other products. It's not just healthier for the animals. On the other hand, I'd also encourage people to read this recent Washington Post article first. Frankly, I used to use cost as a factor in my denial too but the truth is we can't afford to not make better choices if only in the cost of our lost future health. A better and vegan-centered diet has negated most of the ADD issues my daughter was having and we are saving quite a lot on medication just as a simple bit of math which makes up for any additional costs but we aren't eating as much now either as it seems we are getting the nutrition we weren't before so aren't hungry all the time anymore. As to pigs, when my daughter was just a couple years old her best friend's family had a pig who was often in the house. He was a pot belly pig but huge. Bigger than the kids were. One day they were given some lunch but not at a table, instead just a plate while they were standing. The pig behind them tried to get their attention (they had food!!) but they were distracted and not paying attention to him. So he bit my daughter on the elbow. A few days later at a petting zoo my daughter made a beeline for the pig there. I told her I was surprised she wasn't scared. With a matter-of-fact tone she told me it was a different pig. Later she told me that Blake (the biting pig) hadn't meant to hurt her. Pretty insightful for a child not quite 3-years-old. Especially since at that age they often purposely hurt each other and aren't pigs but humans. Even though I no longer eat eggs I do take care of a large flock of pastured chickens part-time because they are a hoot (so to speak). They all have personalities and are very intelligent and funny. They gather in anticipation of my arrival and even jump repeatedly in eagerness. One in particular follows me where ever I go. If I move, so does she. For awhile there were thirty or so roosters (in a separate group) and they too had a lot of charm, with one going out of his way to protect me from the others (not that I needed it but I was flattered). Currently the farm is raising a few turkeys and they've been even more entertaining and charming (and very, very sweet). I'll never return to my former ways which I had only done because it was just the way things were. I do wish I'd been raised vegan. Thank you for your great Bizarros and your entertaining chatter. Thanks for the extra info, much appreciated. Good points, all. @ Bad Wolf: Yes, that comports with what a vet told me long ago. Small herds of cows, sheep, etc., if properly fed and cared for, experience very little disease and if one happens to get sick, a good farmer will separate them from the rest until they are healthy. He said the reason the 'factory farm' herds need antibiotics is due to their filthy and crowded living conditions. These are preferable to factory farms, but you can't feed a population the size of the U.S. with cheap fast food meat with this kind of farming. 99% of animals products you eat, eggs and dairy included, come from filthy, diseased, cruel factory farms. Even if you're buying locally grown, free range, organic animal products, those animals go to the same sadistic slaughterhouses when they are "harvested." If eating meat was "natural" for humans, it wouldn't give us heart disease, cancer, etc. These are a couple articles that support my point. The claims have obviously been disputed I'm sure, but they are still there. First off Dan, I know I'm not going to change your mind. You're a vegan and that's cool, I'm not concerned with your diet. It doesn't upset me by any means. Here's a side story about what DOES upset me. I was talking with a friend of mine about a tasty burger place in town. In the middle of my saliva inducing discussion I was interrupted by a vegan kid sitting next to me. He called me a murderer....that pissed me off. I wanted to hit him. But I didn't, but I proceded in having an argument which I knew wouldn't change his mind. That's just a tid bit. In my opinion, humans weren't meant to eat a strictly vegetarian diet. If this was the case, why would we have teeth that are clearly designed for the tearing of flesh? Canines?? And all primitive tribes and hominids eat meat. Even chimps have been seen eating meat. Now I'm certainly not saying that everything that tribes in Africa do are acceptable for the rest of the world, because that certainly isn't the case. As a modern civilization, I think humans have lost self-control. Things are no longer done in moderation. If I were to eat a pound of bacon and BBQ ribs everyday, yes, that would create an issue. It is simply an increased fat intake that is never good, even with "good fats." Most of these studies focus strictly on saturated fats and dont take into account that those people are potentially increasing their calorie intake, and fat intake. Which, in turn, WILL raise cholesterol. But if we are eating a balanced diet, mixed with meats, vegetables, grains, and dairy, maybe it wouldn't be such a problem. But how many people do you know that actually follow the Food Pyramid? Meat fans are meat fans, and they eat a whole lot of it. Meat is high in calories compared to veggies. Sweet fans are sweet fans, and that is obviously in very high in calories. It's sugar. As far as cancer? It's the same situation. Don't believe everything you hear.